I know I said I wasn't going to buy any dresses or other things I don't actually need this year, but I have to confess that before I wrote my wardrobe review of 2015 and had a good sort-out, I shopped the sales. At a time of year when one can feel the winter blues creep around. I try and get more sleep, cut down on booze, get sufficient daylight and exercise, and eat healthily. Those all help, but the real tonic is shopping! The thrill of a bidding war on Ebay or tracking down that last pair of matching knickers in your size. And when you trudge home in the dark after a day in work, soaked through and weary, the delight of a pink or gold parcel waiting for you cannot be underestimated. 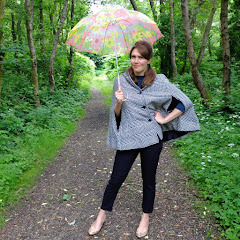 It promises time travel, escapism and glamour in a world of onesies, and it comforts you that, yes, spring will return. 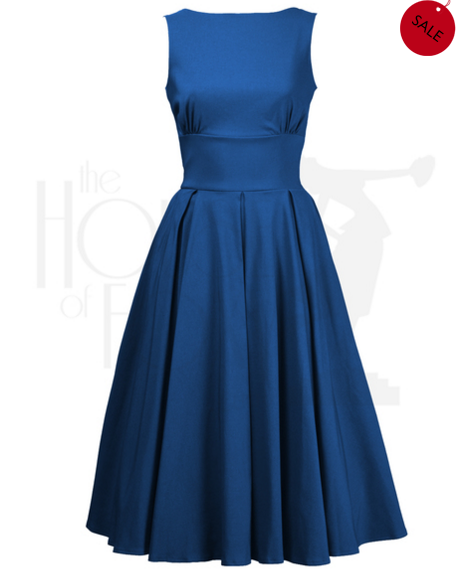 The House of Foxy Betty Swing Dress is a stunning dress, and as it was in the sale and I had a voucher, it was excellent value. I have already worn this to an awards ceremony and will do a full review of this dress very soon. Two Hell Bunny dresses for £12.99 each from Starlet Vintage's outlet on Ebay, the polkadot 'Noreen' and blue 'Colorado'. They both fit really well and the first style is one I'd wear to work as well as for play, so I can see it getting a low cost per wear. 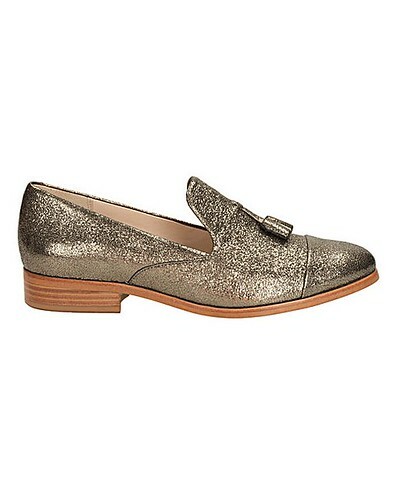 I wasn't sure if I loved or loathed the Clarks Hotel Chic Gunmetal Loafers, but trying them on was a blissful experience - they are like slippers! I had to keep them. My husband hates them. I have some green trousers that I think these will look particularly lovely with. 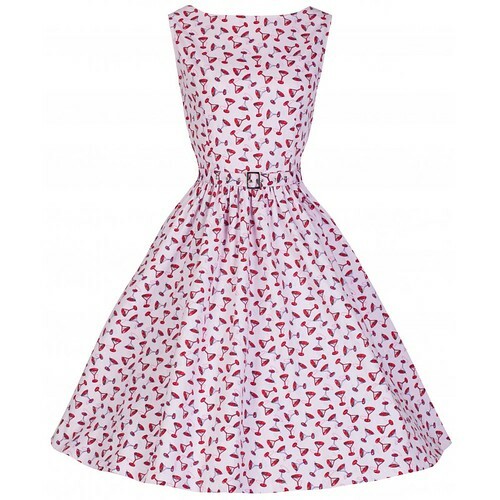 What a wonderful fit the Lindybop Audrey Dress in Pink Martini is! Snagged in the sale for just £8.99. It's a light cotton, so more of a summer dress, but I can see it getting wear for cocktail evenings. 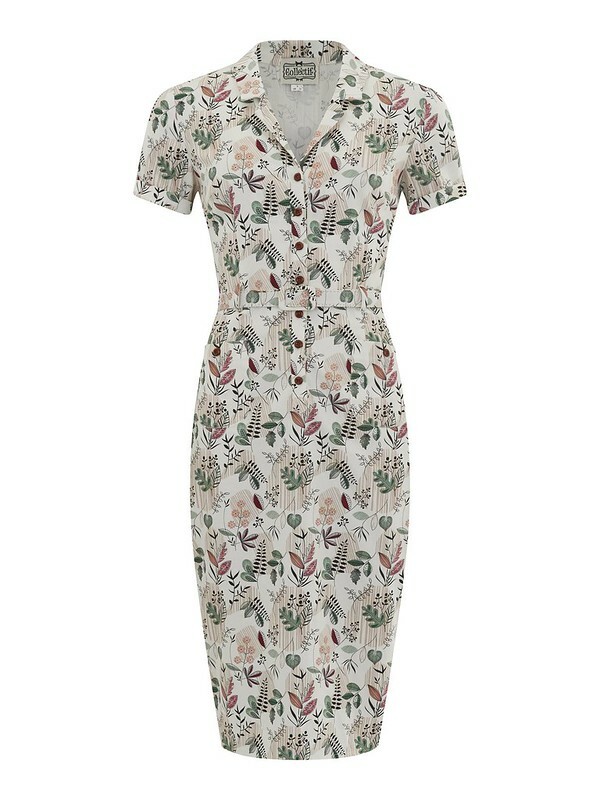 This Lindybop dress had a waist slightly too high, but can be easily fixed by moving the belt loops and wearing a wide belt with it. Another £8.99 bargain, and can be worn to work. 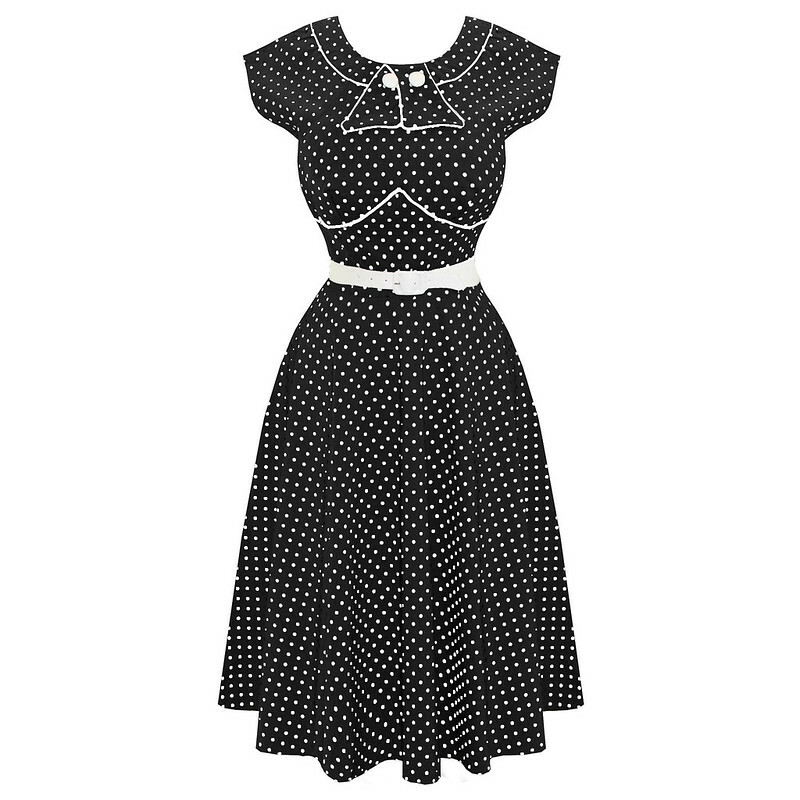 Another sale bargain was the Collectif Mimi Polkadot Dress, which fits beautifully. 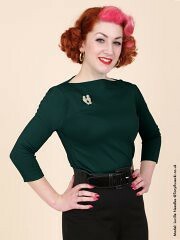 I couldn't resist the Collectif Olive Knit Dress either, also in the sale. It does need some shapewear underneath though, as the knit is quite fine. ...and the Aida Zak Alma 'Holiday Check' dress. Whoops! In total, the four dresses from Collectif came to around £60, which I'm very pleased with. On the search for the perfect tops for work, I tried something a little bit different, the slash-neck top from Vivien of Holloway. 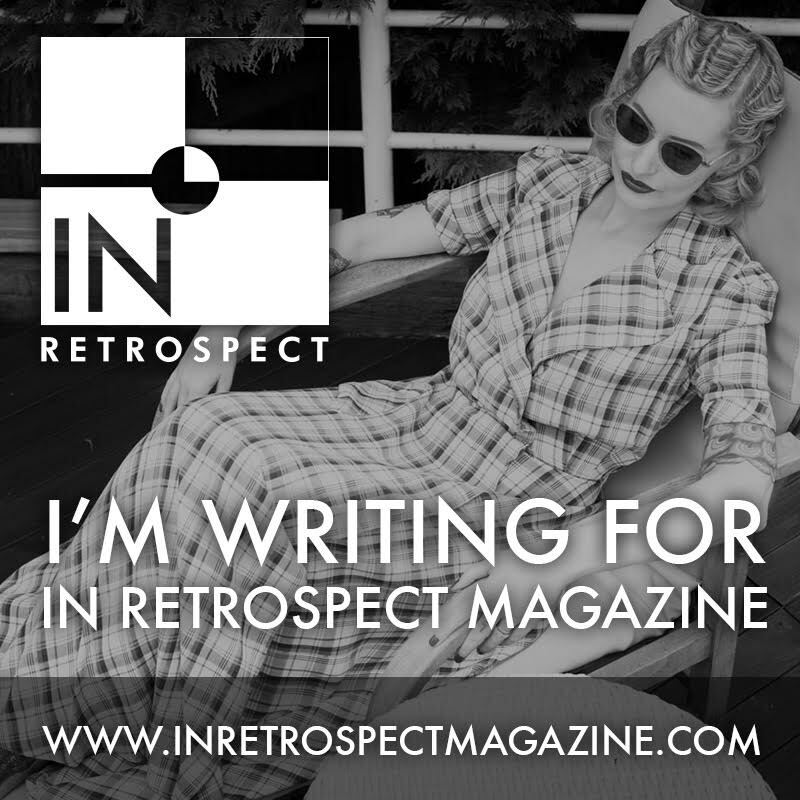 It wasn't on sale but I got 20% off thanks to a code from In Retrospect magazine (valid until 12th February, so pick up a copy to get your code!). The fabric is a gorgeous thick jersey, I have worn this to work already. In terms of non-vintagey items, I bought some more quality items for yoga - at a steal - from Asquith London, as well as stocking up on a couple of basic tops from Uniqlo. There was also a knit top from Traffic People, and a cute top and shorts sleepwear set from Ann Summers. I think that's it. Surely? 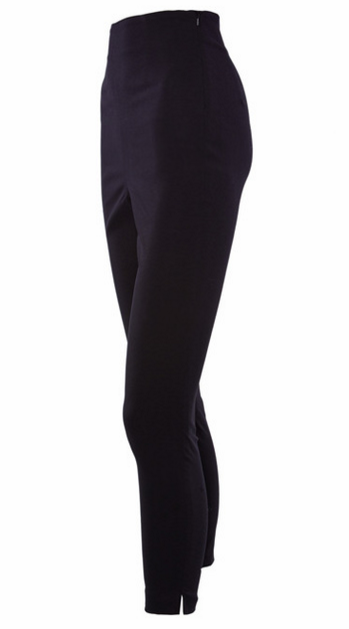 House of Foxy capri pants - I was very sad about these capris, but the fit just wasn't right on me. The waist cut into me (weirdly they weren't too tight anywhere else, it was literally just the waistline) and the legs bunched. I wasn't happy with the zip either. There were loose threads around it, it felt too flimsy, and it was difficult to do up. Maybe a hook and eye at the top would have helped. 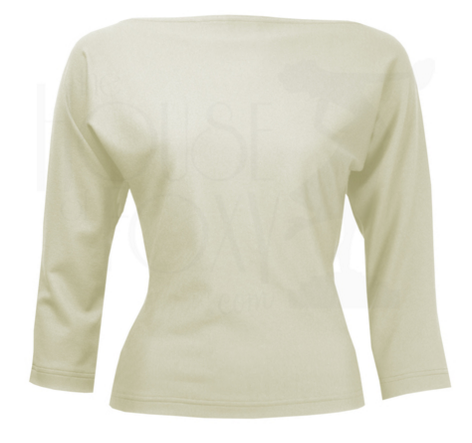 House of Foxy Dolman sleeve top - the 'champagne' colour was a little too beige in real life. This top is a bit more clingy around the waist than the Vivien of Holloway slash-neck top, so in a pale colour it wasn't flattering to my midriff either. 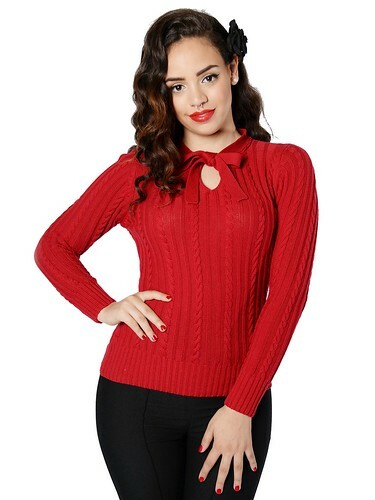 The Collectif Beau Jumper was too long and too chunky. I bought the Boden Crumble Mary-Jane Heels in a size 8, but they really are too big (I'm a 7.5 usually), and they don't have any half sizes left in stock. My husband hated them. The Gossard Retrolution Slip was too short in the body for me, and the cups too voluminous. 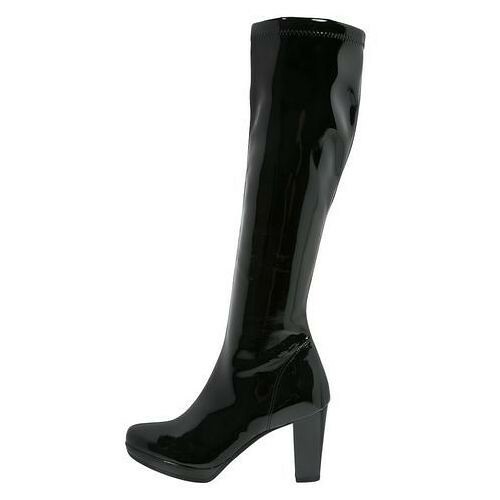 The patent Rapisardi Jolie Boots from Zalando looked like they could be the perfect '60s style boot that I have been searching for, for many years now. Alas, they were too narrow in the foot (despite fitting perfectly on the calves, slim-leg ladies take note of these!). Back they went. At the time of writing this, I'd ordered yet another pair of black knee high boots from Ted and Muffy, but they won't be delivered until February so you'll have to wait until next month's roundup to find out if those were a success. Well, that makes me feel a bit better - I've bought two brooches, a necklace (chazza), trousers (chazza) and a pair of shoes (sale) so far this year and was feeling guilty, so it's good to know I'm not alone. 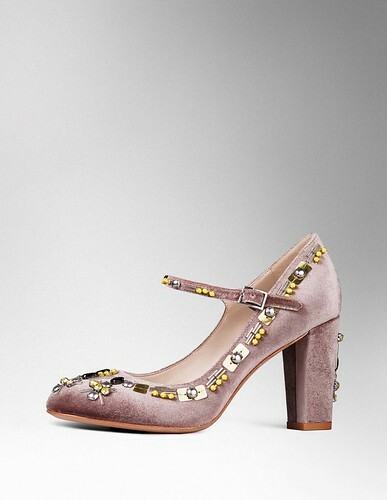 It is hard not to buy pretty things when January is so relentlessly gloomy, isn't it? I'd say you've been remarkably restrained Mim! I do have a splurge in January every year, partly because I ask for vouchers for Christmas. The deals can be super duper too, if you pounce at the right time. Oh my goodness I LOVE your taste in dresses, so classic and feminine. And I liked those shoes but I know what you mean...I'm a 6 and a half and 7 is ALWAYS too big on me! And what IS UP with corsets being so....voluminous. There is nothing more unflattering than a half filled cup! Great buys in general though! Someone had some great luck while scouring the internet for sales! All of these look fantastic! Too bad about the ones that didn't work out, but all in all I'd say you made out pretty darn well. Can't wait to see some of the new dresses on you. Odd - it's not that difficult to get right. Photograph neutral grey card, set white balance for that photo, apply that setting across the entire batch, job done. 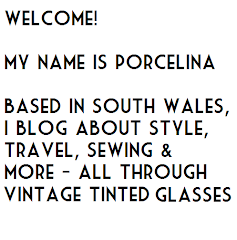 Mim, you are a font of knowledge!! I always struggle to get my red living room wall to not look orange. I will have to look into this. That could be your camera's white balance setting - incandescent light is really yellow - so see if changing the setting to incandescent (a little lightbulb icon) makes the difference. Blimey, that's a very different colour! My biggest disappointment was the 1930s tie neck blouse in sage. It looks quite vibrant on the website but is actually a great deal more subdued. I considered sending it back but I loved the style and the only other option at the time was the mustard colour one, which just doesn't suit me. I only just got my Lindy Bop and Collectif sale purchases, on the whole I wasn't too bad...although I did fall for a fake lipstick scam! 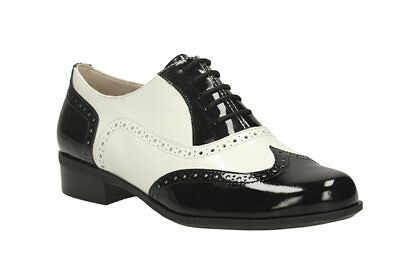 I am in love with those black and white brogues and I was eyeing up that green collectif dress myself but wasn't sure it would suit me. Wow, that's quite a haul! You obviously fared better than me with Collectif, I ordered from them at the end of December and the parcel finally arrived yesterday!!! My parcel did take a while as well, but you must have been at the very bottom of the list to wait that long!! I couldn't imagine not buying any dresses for a year for all the pros of shopping that you listed above! For all the cons of shopping you listed... those are all good reasons to try and not to shop too much! Such a great haul of things that you got. Sorry to hear that not all worked for you but it sounds like more worked than didn't. And there's always returns even if it did take longer than usual to get your money back! Also, that's such an important thing to keep in mind about buying something that's cheap vs. buying something that will be a great addition to your wardrobe! I constantly try to actively think of this one. I shall just have to console myself with my own sale purchases, which were quite extensive, since I only discovered all these wonderful retro brands in the last few months and had a bit of catching up to do! 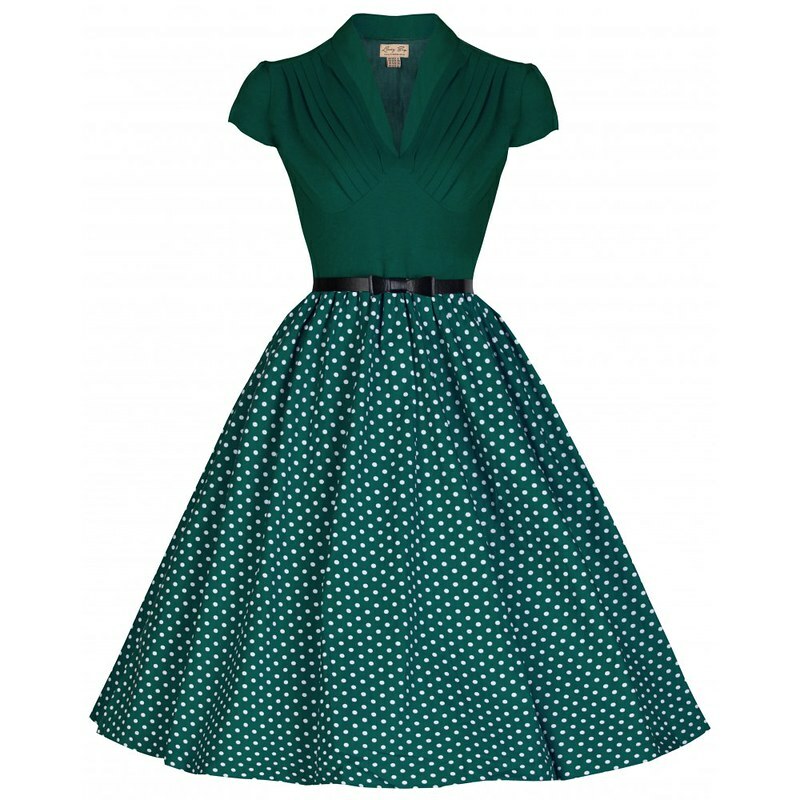 The Lindy Bop Audrey is a beauty as well, isn't it (I got two at bargain prices, in chocolate and green polka dot)? 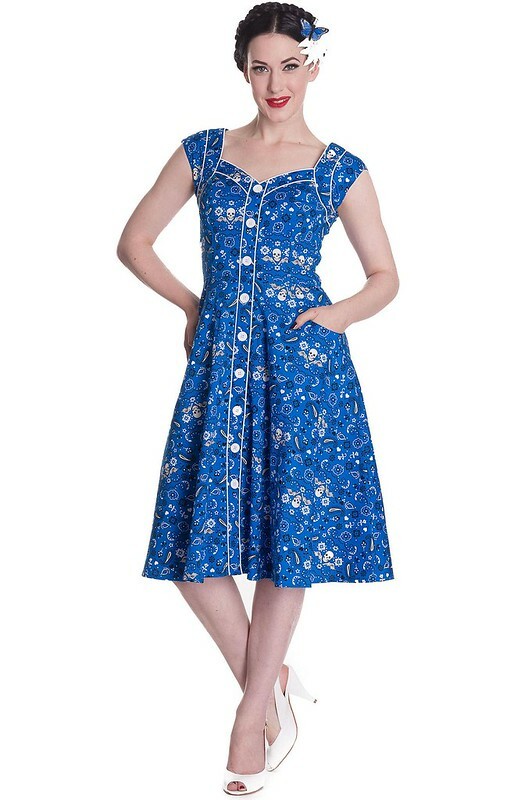 I can't believe I managed to stay away from the collectif sale! You got some fab bargains. I totally agree with the magical restorative powers of a parcel on the door step. I go from zero to hero in a second!!! You asked about where I buy Hell Bunny from. I regularly browse Ebay as there are various online shops that sell last bits of pieces of their stock on there, but my first port of call is always Tiger Milly. They are very reliable, easy to return too if needs be and have great discounts! I have also bought from Attitude a few times and a couple of times from Ripleys. The Hibiscus dress I just bought came from Ripleys but I'd say 85% of my ever expanding collection comes from Tiger Milly!